On June 15, 1969 the Director of the Federal Bureau of Investigation, J. Edgar Hoover, famously declared that the Black Panther Party represented a domestic “threat to the internal security of the country.” What Hoover conveniently failed to mention, however, was that the righteous indignation fueling the Panthers’ growth was the direct result of state-sponsored violence against black people encoded in federal, state, and local law. Yet, just as Hoover painted the Panthers as a foreign usurper threatening the freedom and stability of a domestic nation, the Panthers themselves brilliantly turned the tables and accused the white establishment of being the real foreigners—an outside force intent on destroying a domestic black nation. According to the Panthers, the police were the real terrorists—foreign occupiers roaming black communities intent on spreading violence and fear in pursuit of a nefarious political agenda. This rhetorical battle (that at times also became physical, remember) certainly points to the inherent instability of concepts like ‘the foreign’ with both parties accusing one another of being ‘terrorists.’ At the same time, however, this conflict also exposed the very real global ramifications that were at stake between the Panthers and the American government. Activists today would be wise to take note. Hoover’s declaration, among other omissions, also neglected to situate the racial unrest at home as a critical foreign policy concern. This was something that American propaganda agents fighting the Cold War were acutely aware of. For decades the Soviet Union had been using America’s perennial domestic policy failure to demonstrate how the destruction of black lives in America was proof-positive of the immorality of the American capitalist system at large. Black activists pounced upon on this fact in an attempt to shame America into cleaning up its act (at least for the lenses of the foreign press). In the meantime, Third World revolutionaries were also acutely aware of the plight of black people in America. Solidarity among black, brown, red, and yellow colonized peoples in America was also rapidly bleeding into various diasporic communities of around the world. All this took shape within in the context of several nationalist conceived anti-colonial struggles in Africa, Asia, and the Caribbean. For many scholars, this international landscape is what ultimately turned the tide in the Civil Rights Movement and forced the American state to concede whatever meager ground that it did. The Panthers, perhaps more than any other organization in the United States, understood these dynamics. They saw their mission from the beginning as one deeply connected to these diverse movements for freedom taking place overseas by fellow people of color. Marshaling a pseudo-state status, part of the Panthers eventually moved to their own embassy building in Algiers. It was donated to them by the government of North Vietnam and the Panthers would use it to meet with North Korean diplomats and other communist-inspired people of color from around the world. Following the lead of W.E.B. Du Bois, Audley “Queen Mother” Moore and other signers of the original ‘We Charge Genocide’ report in 1951, Eldridge Cleaver also appeared before the United Nations in 1968 to plead the case once again that Black Lives Matter(ed). While not formally a part of the Panthers, Jeff Fort of the Black P. Stone Nation changed his name to Abdullah Malik Ka’bah, re-branded his organization El Rukn, and met with Libyan leaders in an effort to fund an apparently inevitable armed revolution in America. In short, the most disruptive, revolutionary, and perhaps intriguing possibilities of the Black Freedom Struggle have always contained a deeply international nexus. In one sense, contemporary ‘global terrorism’ is therefore easy to explain through the legacy of the Black Panthers and the current prism of the Black Lives Matter movement. The terrorists win when cops kill a 12 year old child because the cops are the terrorists. True as this may be, the profound international ripple effects of domestic state violence resonating around the world (and vice versa) have yet to be fully explored in our current political moment. What does Al-Qaeda think of Tamir Rice being killed in broad daylight? How does police conduct (or misconduct, for the uninitiated) play into the hand of ISIS and their recruiting tactics? On a more optimistic note, might the heroism and bravery of Black Lives Matter inspire more audacious action by anti-capitalist forces in, say, Greece, or France, or South Africa? Even for conservative Americans with no palpable sympathy for the very real grievances that Muslims around the world have compiled against American imperialism, global capitalism, and use of American foreign policy to suppress democracy, can anyone argue that killing Tamir Rice actually helps the so-called ‘Global War on Terrorism?’ How can it when police brutality is terrorism? How can it when state violence abroad is so clearly connected to the culture of state violence at home? Even without accepting these assertions, however, America’s measurable reputation around the world, at the very least, is never helped when American cities literally burn in the face of racial injustice. Protesters today must capitalize on this fact, not for the sake of improving America’s horrific image abroad (which it rightfully deserves), but for pointing out that America must change its ways both at home AND abroad or face the consequences of an awakened global public. Yet domestic terrorism and internal colonialism against African Americans (by itself) says nothing of the even larger (though granted more recent) phenomenon of American terrorism perpetuated directly overseas beginning with the Spanish American War and marching all the way to our contemporary wars of aggression in Iraq and Afghanistan. Remembering that one of the definitions of a state is that which attempts to monopolize the legitimate use of violence (and, I would add, define any act of violence committed by that state AS inherently legitimate) how can we, as supporters of the Black Lives Matter Movement, see a less violent (domestic) state as the end horizon of our demands? Asking police officers to be less violent is like asking Wall Street to be less greedy. The fundamental animating forces behind these institutions are violence and greed. Properly defined, violence (with greed/capitalism as its economic manifestation) is their raison d’être. Part of this line of inquiry was sparked by a recent Twitter conversation I had with Occupy Wall Street co-founder Micah White about the potential global implications of Black Lives Matter. White began by claiming that “Black Lives Matter is a beautiful movement but it is also (sadly) a regression away from the planetary perspective of Occupy Wall Street.” While I tend to agree that Black Lives Matter will certainly benefit from connecting itself more explicitly to related struggles taking place globally (i.e. the Black Panthers and Occupy Wall Street) it is also true, I pointed out, that for many everyday American protesters, Occupy Wall Street began as a domestic concern over a collapsing national economy and only over time became an entry point for many of the 99% to see this local pain as part of a global process of terror rooted in consumer capitalism. Yes, the Occupy founders had a global vision from the start, but folks on the ground are still coming to terms with to totality of what they are up against. I also argued that any gesture in this direction must begin with a re-narration of the Black Freedom Struggle itself. Its identity must be more accurately understood by contemporary protesters as organically rooted in black internationalism and the geopolitics of a diasporic people who have been fighting against oppression for over 500 years. While many protesters are already there on this point, one need look no further than the AAIHS’s own list of contributors for a powerful introduction into the scholarship taking shape around this idea of re-narrating a global Black Freedom Struggle. Keisha N. Blain, Brandon R. Byrd, Greg Childs, Ashley Farmer, Reena Goldthree, Janell Hobson, Jessica Marie Johnson and several other dedicated scholars on this site are all deeply invested in mapping global black consciousness and the political movements that developed in concert with it. My own work at the moment, focusing on black colonization to the Philippines, is also fundamentally concerned with how the global politics of empire and something like the Filipino independence movement intersected with black efforts to capture state resources in the wake of emancipation. These struggles continue. While White made it clear that his critique is more an organizational one and less a matter of some deficient global vision among Black Lives Matter participants, I would argue that if the goal was to establish branches of Black Lives Matter throughout the world, then ideas matter. An intellectual commitment to the idea that discrimination against Afro-Brazilians in the favelas of Rio, the crackdown against Palestinian protesters in Gaza, and the surveillance against white people involved in radical movements like Occupy Wall Street are all connected must be the starting point. A truly global movement requires a global vision. Again, many Black Lives Matter activists are already moving in this direction with many more still trying to find a way to connect the local to the global. To be clear, pitting Occupy Wall Street against Black Lives Matter is, of course, not what White (a biracial black man himself) is about at all. Solidarity might as well be his middle name. I think he and I would both agree that identifying what both movements can learn from one another while further connecting their already overlapping participants is the real move to make here. Things can be connected without being synonymous. Recognizing global capitalism as a critical driving force behind what currently terrorizes black America, is not the same thing as reducing the Black Lives Matter movement to a pure manifestation of class anxiety or economic structure. Race still matters—but it doesn’t matter in a vacuum. Indeed, the Occupy Movement, at its best, precisely provided a space where activists working on the environment, labor, race, gender, sexuality, and capitalism could all gather together and imagine new possibilities for connecting their otherwise specific concerns on a global scale. This should not (and did not) dilute any of their respective energies but rather multiplied and invigorated them all. On some levels these connections are already happening but more needs to be done. For example, protesters in Gaza were actively sending intel to Black Lives Matter protesters on the ground in Ferguson with their own experiences about how to tactically avoid police barricades, how to treat tear gas exposure, and other acts of solidarity from thousands of miles away. The local Occupy Chicago Movement made the heroic decision some time ago to rename itself and step aside from media reporters so that black-lead organizations now affiliated with Black Lives Matter could become more visible and receive the proper credit for organizing events that local media still lazily attributed to Occupy. 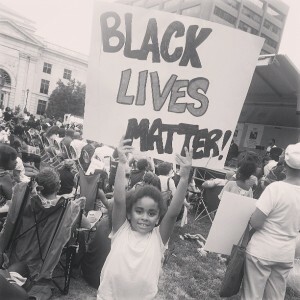 And just like Occupy, Black Lives Matter has also inspired similar movements around the world with its iconic assertion found on signs held by Ethiopian Israelis, black Canadians, and native Ghanaians. These kinds of moves, if replicated nationwide and indeed worldwide, represent profound possibilities, not the least of which would be making the election of Bernie Sanders all the more likely. In the end, White’s assertion that “[o]nly planetary social movements matter now” and that “[i]f your movement isn’t thinking about social change on a global scale then you will fail quickly” may be practically as well as historically true. Black protest movements that have been able to connect foreign policy with domestic policy have almost always proven themselves to be forces for good not just at home but abroad as well. White’s upcoming book, The End of Protest promises a tactical reorientation that should only benefit Black Lives Matter in this direction. 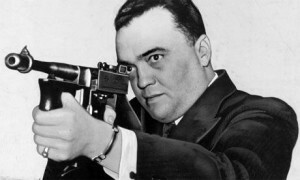 As for the terrorists, if the current director of the FBI James Comey sounds eerily reminiscent of J. Edgar Hoover when he blames Black Lives Matter for a (statistically uncertain) rise in urban crime, we should not be surprised. Terrorists often tell their targets that they brought their pain upon themselves. And when those terrorists kill, terrorists everywhere win. Sign up to get the latest posts from AAIHS and updates delivered straight to your inbox. Each author’s posts reflect their own views and not necessarily those of the African American Intellectual History Society Inc.
AAIHS welcomes comments on and vigorous discussion about our posts. We recognize that there will be disagreement but ask that you be civil about such disagreements. Personal insults and mean spirited comments will not be tolerated and AAIHS reserves the right to delete such comments from the blog. The African American Intellectual History Society Blog is licensed under a Creative Commons Attribution-NonCommercial 4.0 International License.